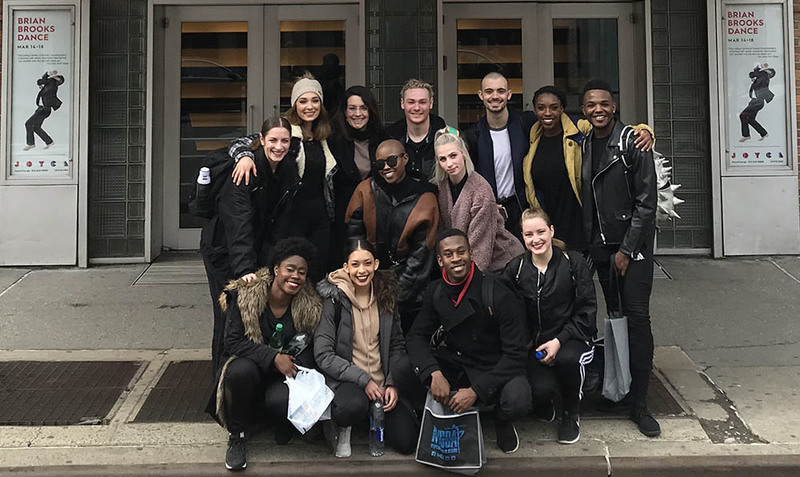 Twelve dance majors represented Point Park University at the New York City Dance Alliance's annual Destiny Rising Gala, held March 12 at the historic Joyce Theater. "This is the third time our Conservatory Dance Company was invited to this gala, sharing the stage with other artists, performing works by emerging and renowned choreographers," said Garfield Lemonius, associate professor. Students performed Kinex, a new work by Associate Professor Kiesha Lalama, at the gala. "The dance department continues to be a leading force in the industry," Lalama said. "Being invited to present a work and continue building our relationship with NYCDA solidifies our position as a premiere training program in the country." Bianca Melidor, a senior dance major with a concentration in jazz, said she was honored to be a part of this experience as a student. "It was quite the honor performing at the Joyce knowing the history of the theater and all of the legendary performers who have been on it," said Melidor. "On top of that, the piece we debuted closed the show and we were all super excited to represent Point Park in that way." "This was an invigorating and unforgettable experience," she said. "My professors at Point Park prepared me for this and instilled real confidence in me. Without that, it would have been difficult to go up on stage and deliver a high-caliber performance."